Grease two 8″ (20cm) round baking tins. Mix all the cake ingredients together in a bowl with an electric whisk or mixer until it all combines into a smooth mixture. Remove from the oven, leave to cool for a few minutes and then remove the cakes from the tins and place them on a cooling rack. 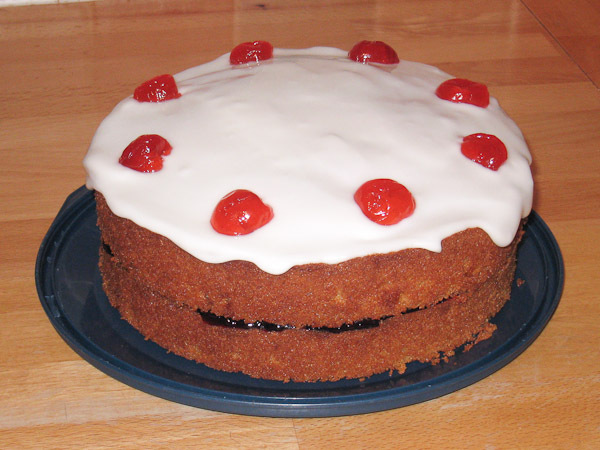 The best jam to use for this recipe is Morello Cherry but I often make this cake on the spur of the moment so don’t always have some in. In this case I just use whatever I have around the house (usually Strawberry!). For the icing you can use either water or lemon juice – personally I prefer to use lemon juice. Place one half of the cake onto a serving plate. Generously cover the top of this half with your jam. Add about half of the water/lemon juice and stir until thick. I find a metal knife the best for this. Cut 4 or 5 glace cherries in half and place them on the top of the cake. If you like flaked almonds, you could place these on top instead. This entry was posted on Saturday, September 10th, 2011 at 9:25 amand is filed under . You can follow any responses to this entry through the RSS 2.0 feed. You can skip to the end and leave a response. Pinging is currently not allowed.